EXCLUSIVE Stir up some holiday fun with our unique cocktail arrangement. 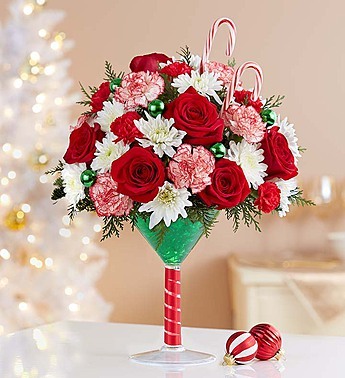 A mix of brightly colored blooms mingles with festive ornaments and real candy canes, adding sweetness to the surprise . Hand-designed inside an oversized martini glass, this very merry bouquet will fill everybody with the Christmas spirit. Hint: re-use glass to create your own signature drink any time of year.